Yesterday Statistics Canada released a report on the impact of studying in public versus private high schools on students’ academic success, titled “Why Are Academic Prospects Higher for Private High School Students?” There are many possible implications for this report (despite it not acknowledging many other cultural factors beyond socioeconomic status, location, and religious affiliation), one of which I’d like to explore here in more detail. Three conclusions emerge from this study. First, on average, students who attended private high schools scored higher on academic tests at age 15, and had higher levels of educational attainment by age 23, than did students who attended public high schools. Second, the characteristics of public and private high school students were different. Compared with public high school students, those in private schools generally came from families with a higher socio-economic status (as measured by parental income and education), and were more likely to be surrounded by peers whose parents had attended university. As well, public and private schools were concentrated in different provinces, and thus, may have followed different curricula. However, few differences in resources and practices across school sectors were observed. Well this merits some discussion, don’t you think? First, the study sends a clear message: students in private high schools are higher academic achievers than their public school peers in general, and are more likely to pursue post-secondary education in the years immediately following high school. For kids currently enrolled in expensive private schools, I imagine these stats give their parents a feeling of relief. For those of us with kids in the public system, we may feel some frustration or disappointment by the outcomes of this study because it implies, perhaps, that our kids are potentially worse off when it comes to earning high grades and going on to college or university than their privately-schooled friends – and there might not be anything we can (afford to) do about it. It’s the final sentence, “School resources and practices played little to no role in the differences in each academic outcome observed” that might especially contribute to that feeling. It makes it sound as if public and private schools are experienced similarly by the students in terms of academic programming and available resources, and that the most important differentiating factor is the degree of wealth of the students’ peers, and whether or not the parents in the school community attended university. What’s prompted me to write a response to these findings is that I see this distinction as an opportunity for the future of our public system, and not merely a sad ‘given’. If, in fact, all that money being spent on private school is actually to place students within a particular culture (a culture of well-off families with higher education), then doesn’t that speak loudly to the need to re-examine public school cultures? If the pedagogical approach is similar across systems, then don’t these results beg us to look at how one-size-fits-all schooling is not the way to go? If the systems are essentially the same in how they function academically and in terms of resources, then doesn’t that present an opportunity for us to do things a little differently in the public system? Perhaps we’ve already been trying to do this. Public school teachers know from experience that the push for ‘differentiated instruction’ – that is, tweaking how we teach to cater to the individual needs of students in our classes – is a way of eliminating the one-size-fits-all school model. The trouble is, most of us struggle to do it. With 30+ kids in a classroom, each with a set of individual needs, interests, and abilities, differentiating instruction can quickly overwhelm even the most experienced teacher. It can feel like we’re pleasing none of the people all of the time, or maybe just a few. Rarely do we feel we are addressing each and every students’ needs on an individual level, to the degree that differentiated instruction mandates would imply we should. And when the school’s resource teacher places a gigantic binder on your desk, containing individualized education plans for 1/3 of your school’s student body, you can’t help but feel that something’s not quite right with the approach. I’m not suggesting we do away with catering to individual students’ needs. What I am suggesting, though, is that this particular StatsCan study might indicate that we need to think about differentiating schools, on a systemic level. And I mean differentiating them culturally, not just in terms of academic instruction. I might as well reveal my bias right now. My research as a graduate student at OCAD University on and off for the past year has focused primarily on this: how do students think about the future, and how does it impact their academic achievement. In the background, I’ve been quietly considering how my own middle-school students over the past decade have related to the idea of their own future, and whether there is any discernible connection between how they see themselves down the road, and how they achieve academically. For instance, if a student in grade 7 is invested in the idea that s/he will attend college or university, does that positively impact his/her academic achievement as compared a student who has no idea of, or investment in, what comes next? I’m inclined to say it does, though I share that cautiously as I have yet to conclude my investigation. If there is a relationship between a student’s investment in their path beyond high school and their degree of academic achievement (or even effort in school) then the results of this StatsCan study can be addressed directly by changing the cultures we create in schools. You see, the study claims that students surrounded by families with parents who are university graduates are most likely to become university attendees and graduates themselves. Might we assume, then, that this is because parental university experience is more likely to foster a family culture that has a built-in expectation of university for its children? If these assumptions are correct, we should begin to look at how to create school cultures that encourage long-term planning and aspirations, even for kids whose families don’t have that experience in their parents’ generation. I’m not talking about doing a careers workshop, or taking kids on overnights to college campuses for experience programs. While those things are surely important and I wouldn’t recommend we do away with them, they may not have the power to create a deep impact on the students if there isn’t a solid foundation laid for thinking about the long view in the first place. If kids who are most advantaged in our school systems are surrounded by future-focused peers and families, then perhaps what we need to do is build an orientation to the future into how we teach and how we run our schools when working with systemically disadvantaged kids. I’ve briefly explored an example of one way to do this here. If the most socioeconomically disadvantaged students in our public school system are also less likely to have a clear vision of a future path for themselves (and there is existing research that describes how conditions of poverty can make long-term planning very challenging), then shouldn’t their school culture be fostering ways for those students to begin to imagine their futures? One aspect of the StatsCan study, when analyzed more closely, reveals that “[i]n the private sector, 72% of principals believed that low teacher expectations of students did not hinder learning at all, while 53% of principals in the public sector expressed this view.” What does this mean? It could mean that the private school children’s family cultures that include an expectation of post-secondary school attendance (and the high expectations of achievement that would accompany that) overrode the need for those high expectations to be embedded in their school culture. Kids for whom expectations of post-secondary education are not part of their family culture may need it to be infused into their school culture to compensate – to both engage them more deeply in their academic pursuits, and support them in envisioning a preferred future for themselves. The researchers did go on to say, however, that “[f]uture research may address the question of whether changing a child’s environment – for instance, through social policies aimed at reducing family poverty – could change the trajectory of brain development and cognition for the better.” They implied that increased financial support to poorer families may be part of the solution. While I certainly don’t argue with that, I would add that there are other potential social policies that might have similar aims (to reduce poverty) that could work in tandem with a financial solution. And how we run our schools – and the specific culture of learning and dreaming and planning for the future that we create in our schools – may be one of the new social policies we consider. The results of both studies have me especially primed to read Situations Matter, by Sam Sommers. Subtitled “Understanding How Context Transforms Your World,” the book explores the forces of influence in our lives. I suspect the book may contain inspiration for how to begin creating schools that foster cultures that better meet the real needs of the communities they serve. The most outstanding administrators and teachers I’ve met have always strived to do this, but the system has failed to adequately acknowledge their efforts. It’s time for the system to catch up. I welcome any criticism, insights, or feedback on what I’ve shared above. These are preliminary reflections on these studies’ findings and I’m looking forward to the dialogues that emerge in response to them. Footnote: Throughout this post, I refer to post-secondary education (especially university) as desirable and, as such, imply that it is the arbiter of success. I want to emphasize that I don’t actually believe that formal post-secondary education is always right for every single person. I do think that what’s important about young people’s orientation to the possibility of further schooling after high school is that it involves having a plan for the future, and acting on that plan. One might argue that academic success in our current public school system is in many ways dependent on young people’s ability to work toward an academic and/or professional goal past high school. Grades are, to many kids, quite an abstract concept that hold weight in terms of what they imply about a students’ prospects going forward. Without a ‘future anchor’ – a goal or dream of what the student hopes to achieve or become after high school – our school systems can seem pointless, and grades virtually meaningless. I believe that as long as our systems of evaluation are set up as they are, that the goal of university and/or college will remain the gauge of success in our system. 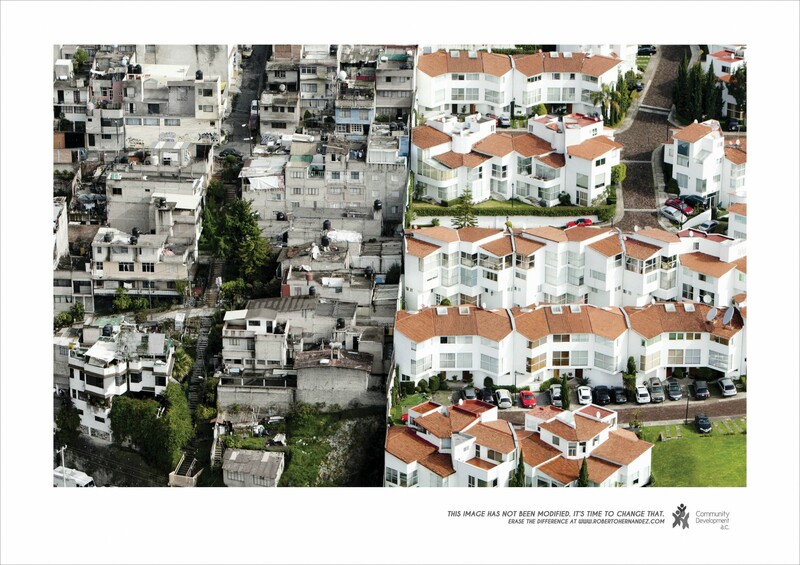 The header image on this page was borrowed from a Publicis campaign, and depicts the stark socioeconomic disparity in Mexico City. It was taken by Oscar Ruìz. I agree, school culture does indeed impact the trajectory of disadvantage students. I’ve seen this in my own school Vernon Malone College & Career Academy which is an early college with a focus on college and career readiness. Our school vision and culture is preparing high school students for college & career. This year I’ve interacted with two students both 11 graders who for the first time in their lives realized that college was an option. One student is already posed to apply to art colleges and the other is pursuing a career as an electrician. Future planning is must for all students, otherwise we run the risk of perpetuating the cycle of poverty. Surely if the study is big enough, “like” comparisons could be made between academic achievement etc amongst similar socio-economic groups. Was that done? Expectations would impact achievement…I agree. Interesting and important subject.